Lightning data available at the GHRC DAAC are described below. Most data are freely available, with Earthdata registration and login, with the exception of a few that require lightning research team permission to obtain. In most cases, browse images and additional software packages are available. Each dataset has what is called a 'Dataset Landing Page', a single web page with background information and links to data access, documentation, dataset citation example, and software for data use. The ISS lightning Imaging Sensor (LIS) is a space-based lightning sensor aboard the International Space Station. The ISS LIS instrument records the time of occurrence of a lightning event, measures the radiant energy and estimates the location during both day and night conditions with high detection efficiency. The GHRC DAAC currently generates both near real-time (NRT) and standard ISS LIS lightning data products. 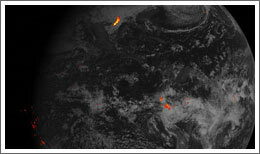 The TRMM lightning Imaging Sensor (LIS) was a space-based lightning sensor aboard the Tropical Rainfall Measuring Mission satellite. 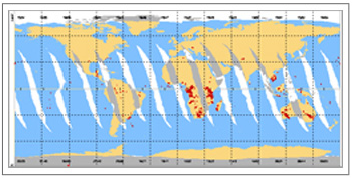 The TRMM LIS instrument recorded the time of occurrence of a lightning event, measured the radiant energy and estimated the location during both day and night conditions with high detection efficiency. This instrument is identical to the ISS LIS instrument. The Optical Transient Detector was deployed on the Orbview-1 (formerly Microlab-1) satellite (1995-2000). The OTD was used to determine the determine the distribution of lightning activity around the globe. 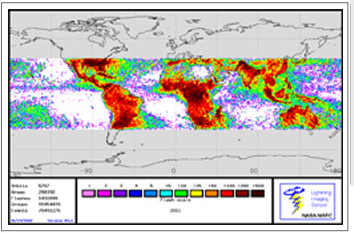 The TRMM LIS Very High Resolution Climatology dataset contains gridded climatologies of lightning characteristics measured by the Lightning Imaging Sensor (LIS) on the Tropical Rainfall Measuring Mission (TRMM) satellite. 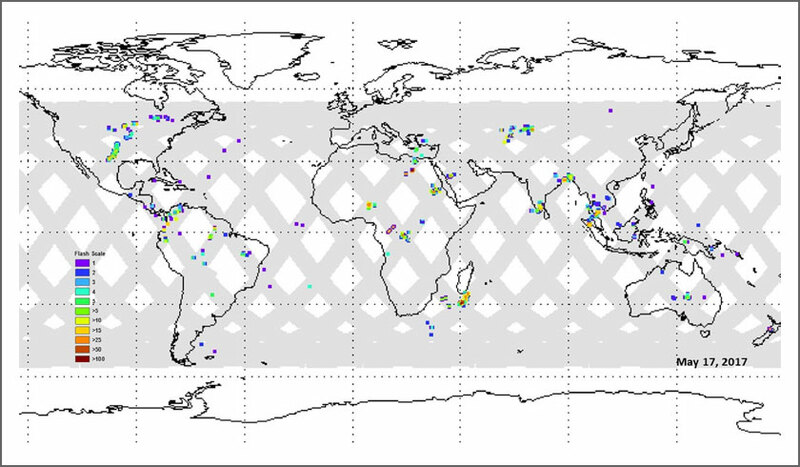 The LIS/OTD Climatology dataset contains various gridded climatologies of lightning characteristics derived by combining both the Optical Transient Detector (OTD) and the TRMM Lightning Imaging Sensor (LIS) measurements. The Geostationary Lightning Mapper (GLM) is a satellite-borne single channel, near-infrared optical transient detector that has been placed on the GOES-16 satellite in a geostationary orbit. GLM detects all forms of lightning during both day and night, continuously, with a high spatial resolution and detection efficiency. 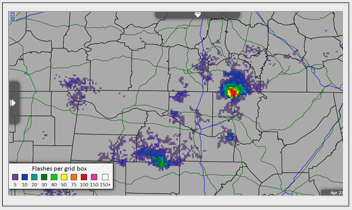 The Lightning Mapping Array (LMA) is a network of 13 ground instruments located in North Alabama and the Atlanta, GA area. 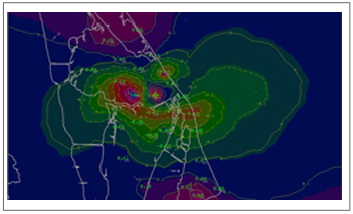 LMA is used to locate lightning activity in storms located within the region. Current and past browse images are available. The Lightning Mapping Array (LMA) is a network of 10 ground instruments located in Washington, DC region. 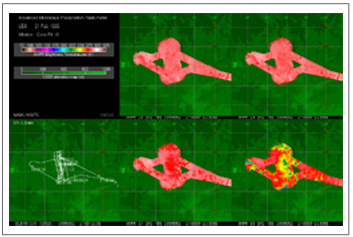 LMA is used to locate lightning activity in storms. Current and past browse images are available. The Advanced Ground Based Field Mill (AGBFM) Network measures the electric field strength at over 30 field mills near Kennedy Space Center in Florida to provide launch lightning warning from 1997 to 2012. The Lightning Detection and Ranging (LDAR) instrumentation detected both intra-cloud and cloud-to-ground lightning from 1997 to 2008 near Kennedy Space Center in Florida. The Large scale Biosphere-Atmosphere (LBA) Lightning Instrument Package (LIP) data from field mills and conductivity probes were collected during one of the TRMM ground validation missions in the Brazilian Amazon Basin during January 23, 1999 through February 14, 1999. Public data can be obtained using data access links and by locating the data in HyDRO 2.0, the GHRC's online data ordering system. Earthdata login is required for data download. Contact GHRC User Services if you need assistance. Most datasets are stored in self-describing HDF (Hierarchical Data Format) files. Information about this format is available from the National Center for Supercomputing Applications (NCSA) at the URL https://www.hdfgroup.org/. NCSA provides a public domain library supporting HDF on a wide variety of computer platforms.